The winter season is here and we know there are lots of Loto box users, new and old, that are waiting for new fasteners for cars with flush rails. They are in the making, but not yet in production. After a few unfortunate setbacks, the goal is to have them before the winter season is over. Meet Jöri, our Loto ambassador! 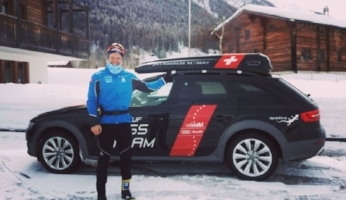 As the skiing season is about to begin, we are looking forward to se how it goes for our Loto ambassadör, Jöri Kindschi who competes for the Swiss nationalteam. GO JÖRI! Do you or somebody you know want to join our Loto team? If you or somebody you know are interested in becoming an ambassador for Loto, let us know! We are always looking for new opportunities and to expand our team. Contact us via the form below or on + 46734082867. We at Loto works to improve our products and service, so please feel free to share your thought and ideas with us! We'd love to hear what you think!